The oceans have absorbed about 28 percent of the carbon dioxide produced by humans globally over the last 250 years (Sabine et al. 2004). This increased carbon dioxide makes the oceans more acidic (reduces the pH), and carbon dioxide emissions are still rising. Globally, pH has declined about 0.1 pH units, or an increase in acidity of about 30 percent (Feely et al. 2009). Acidification will influence all areas of the ocean, including coastal environments and the deep sea. A broad range of marine organisms could be affected, and recent studies indicate that reductions in survival, calcification, growth, development, and abundance are possible (Kroeker et al. 2013). The most negatively impacted organisms will likely be calcified algae, corals, mollusks, and the larval stages of echinoderms (Kroeker et al. 2013). Coral settlement and mollusk larvae were found to be particularly sensitive to acidification (Kroeker et al. 2013). Crustaceans, fish, fleshy algae, seagrasses, and diatoms may be less affected or may even benefit from acidification (Kroeker et al. 2013). In 2009, Congress passed the Federal Ocean Acidification Research and Monitoring (FOARAM) Act, which required an interagency working group to create a Strategic Plan for Federal Research and Monitoring of Ocean Acidification. Regional consortia focused on ocean acidification have been organized in New England (Northeast Coastal Acidification Network) and in the southeastern states (Southeast Ocean and Coastal Acidification Network). Organizations in the Mid-Atlantic are currently developing a comprehensive ocean acidification monitoring network. Surface water measurements using autonomous systems on six ships of opportunity (SOOP-CO2). Dedicated Gulf of Mexico and East Coast Carbon (GOMECC) cruises with surface and subsurface measurements on the NOAA ship Ronald H Brown. This will improve process level understanding of the controls on ocean acidification. Moorings with autonomous instruments to determine the rapid temporal changes and causes thereof. The continued development of the observing system with new instrumentation and protocols. 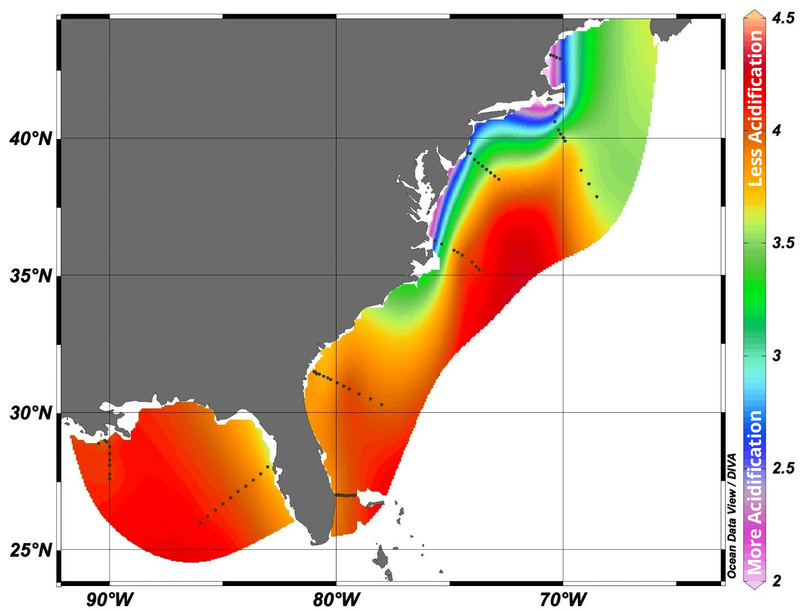 The Mid-Atlantic Regional Association Coastal Ocean Observing System (MARACOOS) links to programs that display and record real-time observations of surface pH. Other ocean acidification efforts in the region include a Maryland State Task Force that examined the impacts of acidification on Maryland waters and produced a report calling for monitoring, industry partnerships, and collaboration with federal agencies to address the threat.